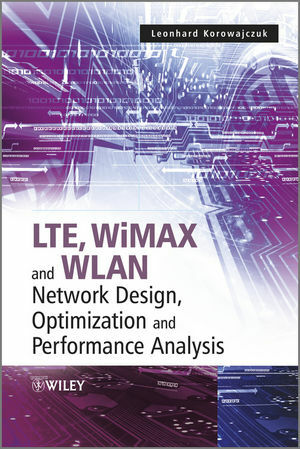 LTE, WiMAX and WLAN Network Design, Optimization and Performance Analysis provides a practical guide to LTE and WiMAX technologies introducing various tools and concepts used within. In addition, topics such as traffic modelling of IP-centric networks, RF propagation, fading, mobility, and indoor coverage are explored; new techniques which increase throughput such as MIMO and AAS technology are highlighted; and simulation, network design and performance analysis are also examined. Finally, in the latter part of the book Korowajczuk gives a step-by-step guide to network design, providing readers with the capability to build reliable and robust data networks. By focusing on LTE and WiMAX this book extends current network planning approaches to next generation wireless systems based on OFDMA, providing an essential resource for engineers and operators of fixed and wireless broadband data access networks. With information presented in a sequential format, LTE, WiMAX and WLAN Network Design, Optimization and Performance Analysis aids a progressive development of knowledge, complementing latter graduate and postgraduate courses while also providing a valuable resource to network designers, equipment vendors, reference material, operators, consultants, and regulators. Leonhard Korowajczuk has 40 plus years of experience in the telecommunication field working in R&D and Engineering areas. He graduated from UFRJ in 1969. His first assignments were in the Energy and FDM area at Standard Electrica S/A, followed by pioneer work on a PCM project at STC in England. He was part of the group that created the Telecom R&D Center (CPqD) in Brazil, where he did pioneer work on TDM switching. Next he joined Elebra S/A (later Alcatel do Brazil) where he was in charge of the Switching and Wireless Divisions. In 1992, he founded CelTec Tecnologia de Telecomunicações in Campinas, SP, Brazil, and in 1994 CelPlan Technologies in Reston, VA, USA, to provide design and optimization software for wireless operators. He was CTO of Comsat/Plexsys, were he was responsible for the development of advanced wireless equipment. Today he is CEO and CTO of CelPlan International, a company with subsidiaries in several countries that provides design and optimization solutions for wireless operators. His team have done hundreds of designs of Cellular, PCS, WLAN, WiMAX and LTE networks worldwide. He is also the head of the Wi4Net division, which provides Citywide Video Surveillance Networks for Public Safety, using technologies like WLAN and WiMAX.